Heres a superb new online game from Yggdrasil. Ever wanted to swing from vine to vine while making friends with all of the tropical animals that you'd encounter in the jungle, all the while making big winnings with every matching combination that you'd get on your reels? Go ahead and try some of our UK video slots! Well, thanks to Yggdrasil, you're able to get just that when you get back home and load up the online slot game, Jungle Books, on your laptop, tablet, or smartphone! Remember that book Jungle Book which is about the young boy Mowgli being raised by wolves and befriending many animals in the jungle? Once you start playing the game, you'll feel like you're making up your own adventure in the tropical landscape of the Indian Jungle! There are some iGaming developers that are trying to make it big in the industry, there hasn't been one that has succeeded in surpassing all of its competitors as triumphantly as Yggdrasil. Due to the fact that the last CEO of NetEnt is one of the creator's behind Yggdrasil, you can be sure that they know what they're doing when it comes to developing and releasing casino products. What makes this developer very iconic is the fact that they only use the most advanced and best technology that they can integrate into all of their online games. The evidence for this point can be found in some of their other games such as Vikings Go Berserk, Golden Fish Tank, and Empire Fortune. You cannot say that I'm lying here, especially with all of the great reviews that those games have already received! You can play on our slot games today created with quality by Yggdrasil Gaming at Wizard Slots here. You won't believe how multilayered this game can get when you see their 2 1x4 reels and 3x3 reel all conjoined together to give you the best winning combinations that you could get. Think about the 5 main characters that you could remember from the story, and convert them into 5 different realms that give you different prizes. Know more games that made to the top from different categories when you visit here. Each realm has a different background that varies from a rocky cliff at the dead of night, and the entrance to the ancient ruins within a vast rainforest. As mentioned, each of the 5 characters has their own realms, which also includes 2 special features. The realm hosts are placed on the left-hand side of the screen, and when they leave, you'll be taken to a new and exciting realm. Sometimes, realm guest can appear on the right-hand side of the screen, and if they do, they can trigger triple combo features with 1 of the BONUS FEATURES that they may bring with them. The low paying symbols are the typical hearts, spades, clubs, and diamonds that are cut out from wood. And the high paying symbols are the exotic looking fruits that you would find in any jungle, with the highest paying symbol being the 3 pears dangling from the vines. WILD Logo: This symbol simply replaces all of the base symbols to help you gain the winnings that you want. Mowgli Special Features: The boy's features in his realm are synced reels and spreading WILDS that can take over the reels. Baloo Special Features: The bear's features in his realm are stacked symbols of the same kind, along with a honeycomb bonus that gives you an instant prize. Bagheera Special Features: The black panther's features in his realm are the Wild Fruit that acts like a WILD and the random multiplier that gets added to your winnings. Shere Khan Special Features: The Tiger's features in his realm are the sticky WILDS and the stacked WILDS. Kaa Special Features: The snake's features in his realm are the triple WILDS symbol that multiplies your winnings by 3, along with a Win Both Ways symbol where all lines pay from both sides. 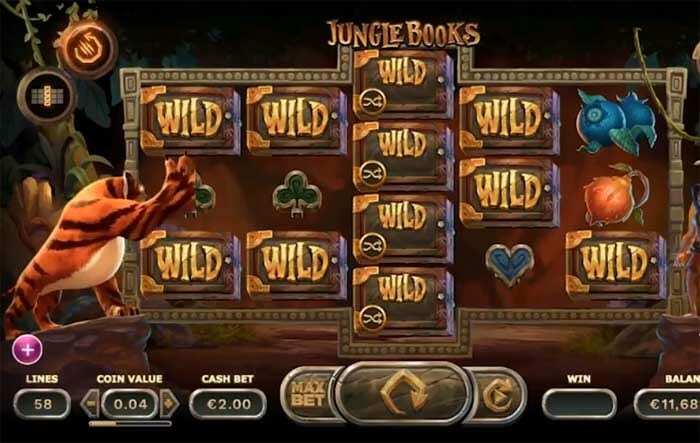 When there are so many rounds, features, and ways to win on Jungle Books, it can seem a little bit daunting when you enter the slot game. Almost like entering the jungle itself, right?